This centralized hub allows anyone to donate to an existing GoFundMe or start a campaign and raise money for an individual or a charity. Additionally, if a donor would like to make a tax-deductible donation towards GoFundMe campaigns for those impacted by Irma, they can make a contribution to the Direct Impact Fund. The Direct Impact Fund is an independent, registered 501(c)(3) non-profit organization that selects campaigns for the GoFundMe community to support. 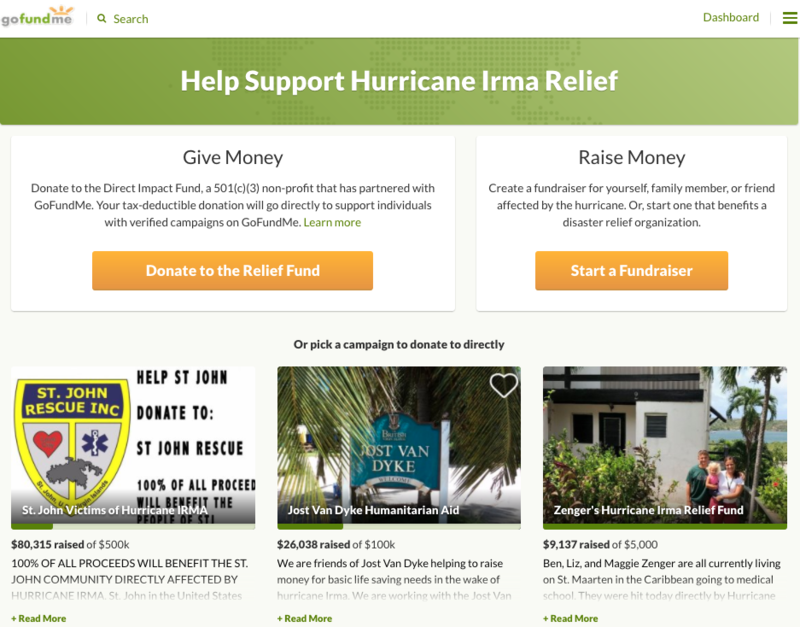 When a donor supports the Direct Impact Fund via www.gofundme.com/Irma, the funds will be distributed to verified campaigns created to help people directly affected by Irma. The GoFundMe team has been working with state and local officials in preparation for Hurricane Irma. GoFundMe’s Trust & Safety Team briefed officials in Florida on the steps we take to protect donors and recipients, and we explained our guarantee that all of the funds raised on GoFundMe go to the right place.